New With Tags Size 18-20 0range And Red Floral Summer Dress. Condition is New with tags. Crossover straps. Sf home Dispatched with Royal Mail 2nd Class. D ra pe s beautifully, slightc ri nk le t o sk ir t fabric. It has no label giving the fabric, but I believe it is in a stretchy viscose and elastane fabric in a paisley print of black, white, purple, turquoise and pink. It has a tie halter neck, with a crossover V neckline. It has a ruffle neckline. Gorgeous dress for any occasion! This is a brand new dress from Accessorize Size M This is how Accessorize describes this A maxi dress takes holiday styling from beach to bar effortlessly, and our Crochet top maxi dress is a hero piece for the hotter temperatures. Gathered for a flowing skirt, this backless design features an intricate crochet bodice with a V-neck and tassel ties at the back From a pet and smoke free home If you like this then you are sure to love the other amazing items that I have for sale in this size as well as for the whole family so do take a look as I am always happy to combine postage costs. Stunning dress from BooHoo. long full length maxi style with a quirky plaited leather halter strap that is fully adjustable and ties at the front with leaf detail to the end. Elastic band around the waist for shape and a long straight skirt. 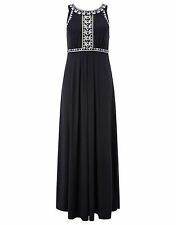 Ladies versatile and flattering black mix maxi dress Size 18 VGC Please ask any questions Always combine postage, as in as many items in one parcel sto save on postage Pay pal please within 24 hours of winning bid Any problems, don't leave negative feedback,I always wash and make sure items are in good condition, but sometimes an item slips thru the net so please email me first, if their is a problem with the item not mentioned you will obviously get a full refund and return postage paid, no questions asked....i am a very fair and friendly ebayer!! My feedback is extremely important to me......thankyou for looking at my items. Beautiful floral tiered halter neck maxi dress, lovely vibrant colours . Size 16 from next petete. Thanks for looking. It's very long so would suit a tall person. there's a tie belt from the side seam that. a flattering dress very striking Style. brings in the waist real nice. Great Condition looks unworn the fabric is soft and supple. Ladies Accessorize Dress Ideal for the beach. Grey and blue. Billie & Blossom (Dorothy Perkins) multicoloured maxi sundress. - Abstract tie dye style pattern - Halter neck & elasticated back panel (no zip) - Deep neckline - Fitted bust & loose flowing skirt - Soft lightweight viscose Size 14 (shown on a 10) Underbust stretches to approx 36" max Length (pit to hem) 48" There is a thin flaw in the weave (final image) but otherwise excellent condition. Let me know if you have any questions, I am happy to help. Oasis dress. Condition is New with defects. I have said with defects because I cut off ribbons under arms but I never wore the dress. Dispatched with Royal Mail 1st Class. PINK EMBROIDERED HALTERNECK MIDI DRESS. GHOST LONDON. SIZE:P UK 8. Anne Brookes Halter Neck Summer Holiday Pink Dress size 18 Petite. Condition is Used. Dispatched with Royal Mail 2nd Class. Dress only worn once. From a smoke and pet free home. Thanks for looking! Summer Dress Full Skirt Halter Style Neck . 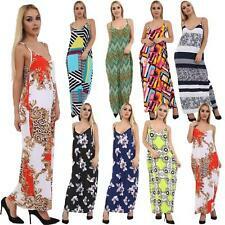 Summer Dress Full Skirt Halter Style Neck, multi floral on white background . . Condition is Used. Dispatched with Royal Mail 1st Class. COLOUR: BLUE BACKGROUND WITH PINK, ORANGE, GREEN ,CREAM FLORAL PRINT. PHOTO NO: 9 SHOWS A BIT OF WEIRD STITCHING WHERE THE BELT JOINS THE DRESS, THIS WAS LIKE IT WHEN I BOUGHT THE DRESS BUT DOESN'T EFFECT THE LOOK. Hi, This is a Stunning Black & White Halter Neck Belted Stretch Dress By Look In Size 8 Eur 34. This gorgeous midi dress (calf length) has a cross over top and is amazingly stretchy making it not only fit correctly but you can also feel safe in it. Emerald Green And Gild Block Printed Fishtail Dress . Dispatched with Royal Mail 1st Class. Cream viscose material with a textured crepe crinkle feel. Size EUR 34 which is UK 8 but is a an oversized baggy style so would also easily fit a size 10, it is on a size 10 dummy for comparison. ZARA FLORAL PRINT HALTER NECK DRESS SIZE M BNWT💐. Condition is New with tags. Dispatched with Royal Mail Signed For® 2nd Class. 100% Rayon: Black background, multicolored peacock/floral print. To fit UK size 10 to 16. Length 40" (105 cm) from shoulder to the bottom hem. New Boden St. Lucia Halter Neck Summer Dress UK Size 12 Never worn. I would describe the colour as olive/khaki green. Buy it now for just £24.99! Any questions please contact me and remember to take a look at my other quality items. Should there be anything unsatisfactory the buyer will always come first. MADE FROM COOL STRETCH VISCOSE MATERIAL. TWIST FRONT DETAIL. THIS IS A GORGEOUS DRESS BY LOOK. IDEAL FOR THE COMING PARTY SEASON. It has uneven hem: it is 85 cm long at the shortest part, and 120 cm at the longest part. 100% Rayon batik hand-printed material: black background with white leaf print. Black and white rayon. To fit UK size 12 to 16. TU, Ladies summer tropical floral print halter neck beach dress, size M (14)	TU Ladies summer beach jersey dress Halter neck style, tropical floral print Dip hem Size M, will fit approx size 14 measurements when lay flat armpit to armpit: 48cm shoulder to hem: approx 82cm front, back 95cm. Tie up neckline at back. 100% viscose. It has uneven hem: it is 85 cm long at the shortest part, and 120 cm at the longest part. 100% First Quality Rayon material: black background with multicolored feather print. Black and white rayon.